Warts are one of several soft tissue conditions of the foot that can be quite painful. They are caused by a virus, which generally invades the skin through small or invisible cuts and abrasions. They can appear anywhere on the skin, but technically only those on the sole are properly called plantar warts. Children, especially teenagers, tend to be more susceptible to warts than adults; some people seem to be immune. Most warts are harmless, even though they may be painful. They are often mistaken for corns or calluseswhich are layers of dead skin that build up to protect an area which is being continuously irritated. The wart, however, is a viral infection. It is also possible for a variety of more serious lesions to appear on the foot, including malignant lesions such as carcinomas and melanomas. Although rare, these conditions can sometimes be misidentified as a wart. It is wise to consult a podiatric physician when any suspicious growth or eruption is detected on the skin of the foot in order to ensure a correct diagnosis. 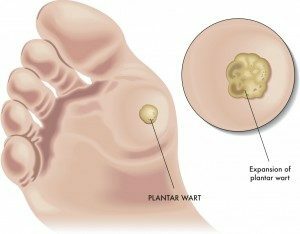 Plantar warts tend to be hard and flat, with a rough surface and well-defined boundaries; warts are generally raised and fleshier when they appear on the top of the foot or on the toes. Plantar warts are often gray or brown (but the color may vary), with a center that appears as one or more pinpoints of black. It is important to note that warts can be very resistant to treatment and have a tendency to reoccur. The plantar wart is often contracted by walking barefoot on dirty surfaces or littered ground where the virus is lurking. The causative virus thrives in warm, moist environments, making infection a common occurrence in communal bathing facilities. If left untreated, warts can grow to an inch or more in circumference and can spread into clusters of several warts; these are often called mosaic warts. Like any other infectious lesion, plantar warts are spread by touching, scratching, or even by contact with skin shed from another wart. The wart may also bleed, another route for spreading. Occasionally, warts can spontaneously disappear after a short time, and, just as frequently, they can recur in the same location. When plantar warts develop on the weight-bearing areas of the footthe ball of the foot, or the heel, for examplethey can be the source of sharp, burning pain. Pain occurs when weight is brought to bear directly on the wart, although pressure on the side of a wart can create equally intense pain. Change shoes and socks daily. Avoid direct contact with wartsfrom other persons or from other parts of the body. Do not ignore growths on, or changes in, your skin. Visit your podiatric physician as part of your annual health checkup. Self treatment is generally not advisable. Over-the-counter preparations contain acids or chemicals that destroy skin cells, and it takes an expert to destroy abnormal skin cells (warts) without also destroying surrounding healthy tissue. Self treatment with such medications especially should be avoided by people with diabetes and those with cardiovascular or circulatory disorders. Never use them in the presence of an active infection. It is possible that your podiatric physician will prescribe and supervise your use of a wart-removal preparation. More likely, however, removal of warts by a simple surgical procedure, performed under local anesthetic, may be indicated. Lasers have become a common and effective plantar warts treatment. A procedure known as CO2 laser cautery is performed under local anesthesia either in your podiatrists office surgical setting or an outpatient surgery facility. The laser reduces post-treatment scarring and is a safe form for eliminating wart lesions. Self treatment is generally not advisable. Over-the-counter preparations contain acids or chemicals that destroy skin cells, and it takes an expert to destroy abnormal skin cells (warts) without also destroying surrounding healthy tissue. Self treatment with such medications especially should be avoided by people with diabetes and those with cardiovascular or circulatory disorders. Never use them in the presence of an active infection. Dr. Timko utilizes many types of plantar warts treatment such as canthrone plus topical, cryosurgical treatments, and other conservative measure all depending on type of warts and history of the wart. Avoid self plantar warts treatment with over-the-counter preparations. Seek professional podiatric evaluation and assistance with the treament of your warts. Diabetics and other patients with circulatory, immunological, or neurological problems should be especially careful with the treatment of their warts. Warts may spread and are catching. Make sure you have your warts evaluated to protect yourself and those close to you. If you have a plantar wart on your foot and home remedies or OTC treatments have not helped, please call us for an appointment today to our Eureka, MO office at 636-486-0033.